This re-release comes in time for cross-promotion with the October release of Vanessa Briscoe Hay’s more recent project, the release Waves by Supercluster [note: she still has a punkish, girly snarl, even at 54]. 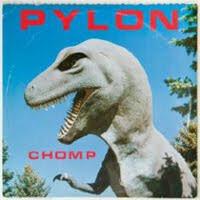 And, perhaps not so timely, less than a year after the death of Pylon’s guitarist Randy Bewley. Just as DFA released a remastered version of Pylon’s 1980 record, Gyrate [Gyrate Plus] we’re now given a remastered take on their follow-up, 1983’s Chomp. The angular bass, jangly guitar and minimal, post-punk style drumming still hold up in the way that perhaps Delta 5 (arguably one of their English counterparts) holds up, in the sense that they don’t sound dated because they truly wrote cleaner, better songs than most of those who’ve attempted to imitate them in recent years. There are also four bonus tracks, including a version of “Yo-Yo” that’s got the pitch of Briscoe’s vocals shifted down to the territory of man, and the almost-industrial sounding “Four Minutes,” which has the rhythm of “Beep” but, erm, also brought down in pitch.